1. This report covers the Qld and SA treks. The Qld trek was conducted from 9 to 14 August and was the first run in that state. It was conducted as a pilot program to ascertain the viability of future treks. In SA, the male and female treks ran from 20 to 25 September. A number of staff from SA travelled to Qld to assist with the initial trek conduct. The longer term intention is to train and employ staff from Qld to make that operation self-supporting. 2. For the second year, the SA treks included a female version which was conducted concurrently but separately to the male. This year reinforced our earlier experience with the female team, confirming that females are not as flexible in terms of overnight stays, preferring strongly to have access to showers and flushing toilets. This can be managed but does cause issues with staff movement from the male to the female team to present. This aspect will be covered later in this report. 3. The bush in SA was looking good having had about 70 mm of rain in the preceding month. Surface water was present in some creeks. The bush in Qld was dry although normal for that time of year. The aim of Trojan’s Trek is to provide a setting and conditions under which participants experience a lasting positive shift in personal values and interpersonal relationships. 6. These objectives have been reviewed and remain valid. The philosophy backing the trek is one which enables successful condition self-management resulting from changes in participant perception. This in turn changes behaviour and personal interaction in a positive way, and although these objectives appear simple in concept, the successful delivery depends heavily on the credibility of the advice given. Therefore the part played by the staff in the process cannot be over-emphasised. two to three months later. 10. The number attending the male trek in Qld was fewer than expected, the target figure being twelve. A better response is predicted for future treks. 11. Four serving members from 7 RAR attended the male SA trek as well as one ex NSW police officer. This is the third police officer who has attended a trek. His inclusion was due to a personal approach from his sister. Initial feedback has indicated that he benefitted significantly. 12. All services were represented among the female attendees. For the second year, HMAS Albatross at Nowra nominated a past trekker to attend. Realising the benefits which result from trek attendance, the navy paid for travel from Nowra. Her contribution was valuable and appreciated. 13. Qld. Providing sufficient competent staff for the Qld trek proved to be challenging. To resolve this Dogs Kearney and Moose Dunlop flew from SA to take part in the trek. As well two members, who were camp and kitchen staff, travelled by road from SA carrying the swags and some additional cooking gear. 14. SA. The SA trek is more difficult to staff. There are two teams which operate some distance apart and two of the male facilitators are used to present material to both. This is problematic as travelling times are slow and teams are denied some of their staff for varying periods. This problem is being addressed by embarking on a program to train female facilitators to enable them to present sessions which the males have presented to date. This will occur early in the New Year. 15. The weather during both treks was as anticipated and predicted. The Millmerran area was subjected to below zero morning temperatures. 16. The funds for the 2015 treks were raised in both SA and Qld and devoted to activities in the respective states. a. SA. The SA treks were funded from a number of sources. Each year the foundation conducts a major fund raiser with the Veterans’ Support Walk in October. These funds were complimented by a number of other organisations and corporations as well as individuals. This year a $10K gant was secured from SA Health to support the initiative. b. Qld. The Qld trek was funded by RSL Care and RSL Qld who have been aware for 3 years of the successful outcomes achieved by the program. Their financial support has been secured into the future. One 13 seat bus to carry the team and one staff supervisor to Captain’s Mountain, the start point. Six vehicles (3 x 4 WD vehicles and 3 x AWD Vehicles) were hired for the duration of the trek. 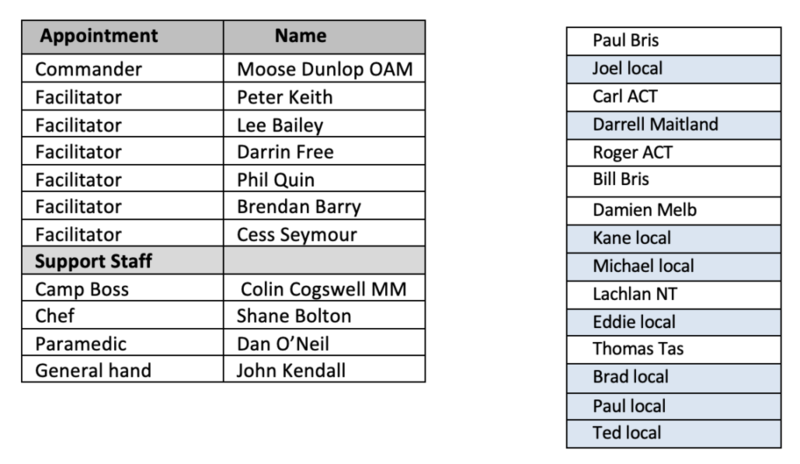 These were supplemented by a Hilux 4WD owned by one of the mentors. The vehicle with the enclosed trailer was driven from South Australia. At the conclusion of the trek, staff and participants returned to Brisbane in the 4 WD vehicles. Two 22 seat buses to carry the two teams and one staff supervisor per bus to Moolooloo HS. Eleven 4 WD vehicles; two towing a covered and an enclosed trailer, and one towing an uncovered trailer. These were also used to transport the staff to Moolooloo HS. At the conclusion of the trek, staff and participants returned to Adelaide in the 4WD vehicles. 18. The insurance excess which applies to hire vehicles in the case of accident remains a matter of concern. In spite of a payment of $33 per day per vehicle to reduce the insurance excess to the minimum in the case of accident, the excess remains at $2,500 (single vehicle accident) and $550 (multiple vehicles). 19. Qld. The trek location is approximately 300 km west of Brisbane. 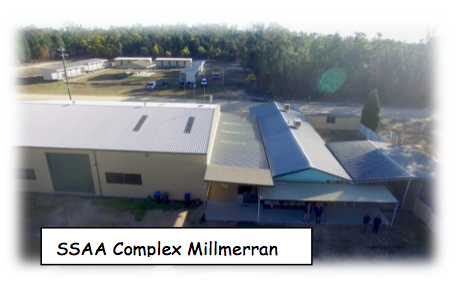 The base was established at the SSAA Range complex which is 20 km west of Millmerran on the Gore Highway. The facility is well presented, has a full time curator, an industrial kitchen, dams and with a capability to cater for about 200 people. The property occupies approximately 400 acres which varies in type and relief from north to south. The property adjoins a national park and state owned forest covering a further 30,000 hectares to which the trek had unfettered access. The hiring arrangements with SSAA are most agreeable. 20. SA. 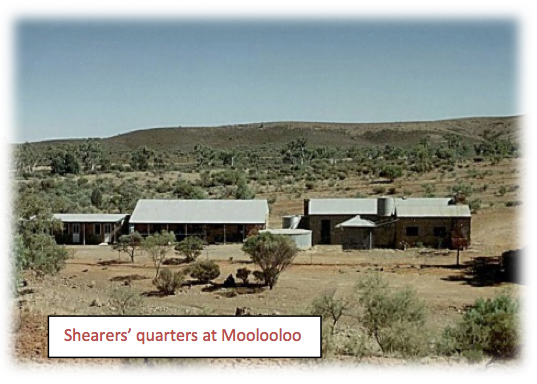 The trek established a base at Moolooloo HS Shearers’ Quarters which is 32 km NE of Parachilna on the Glass Gorge Road. The station occupies approximately 540 square miles of country which varies in type and relief from east to west. 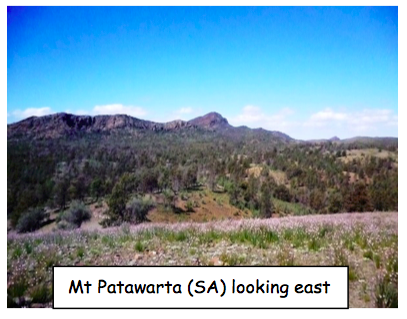 The distance to the area of the trek is approximately 520 km from Adelaide. Travelling these distances is time consuming and expensive in fuel, but the advantages in having no mobile telephone, television or radio reception more than offset the disadvantages of travel. A trip of this duration also permits the participants to get to know each other en-route. The feedback from the participants on the location is positive. 21. A press release prior to each trek was issued through the RSL. The ABC SE Qld attended the Qld trek and a sensitive TV report went to air. In SA the Sunday show on ABC 891 carried an interview with the Project Director. 22. The use of a period set aside daily to complete individual journals has proved to be an important element for participants. The journals are used to record personal responses to the various lessons of the day and to make general comment on the trek. This has proved to be satisfactory from the point of view of progressive comment and also provides an opportunity to collectively review and anchor the day’s lessons. Although these comments are qualitative they do represent the perceptions of the participants at the time and are not always strictly in accord with the quantitative measurements gained via the psychosocial instruments listed at paragraph 7. 23. The messages which are conveyed during the trek are related to relationships and behavior management. Simple subjects; but the style and method of delivery combined with the surroundings make the messages much more powerful. There is no doubt having read the journals, that the live-in nature of the trek when shared with other veterans is a significant factor in the success of the program. b. SA. The nearest fully equipped hospital is at Hawker, approximately 1.2 hours away. First line medical support was provided by a Victorian Ambulance Para-medic. He reported with his own vehicle and equipment. A number of other staff are also qualified as senior first aiders. The longest exposure to the most serious risk was assessed as traffic accidents during the trip to and from Moolooloo. No medical or psychiatric issues arose. 25. Program content in both states is the responsibility of the Project Director, Moose Dunlop. The delivery of the male program and most aspects of the female program is the joint responsibility of the Chief Instructor Dogs Kearney and civilian consultants Peter Keith and Andrew Badenoch. Additionally a number of female centric topics were presented to the female team by the two female facilitators, Connie Jongeneel and Anna Sutcliffe. These treks again utilized the opportunity to provide further training for other past trekkers who are part of the succession plan. 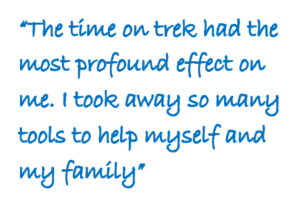 A female RAN member who previously attended as a trekker attended 2015 as a mentor. It is hoped her involvement will continue. In accord with the philosophy on which the trek is based; that is veterans helping veterans with oversight of the tribal elders. This approach has been adopted over many thousands of years by other civilizations. 27. The tenor of the week is relaxed yet highly focused on outcomes. This comes as a surprise to most of the participants whose expectations are for the experienec run along military lines. This is the antithesis of the practice. 28. 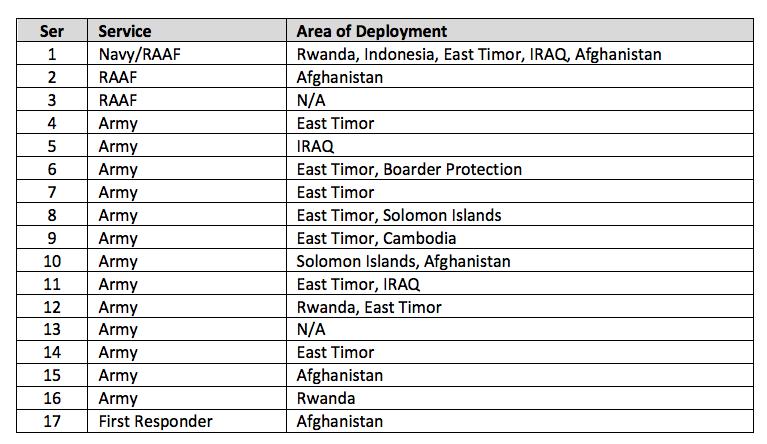 The inclusion of two civilian experts provides a balance to the military presence. They deliver sessions linked to their expertise and are skilled in providing advice and encouragement in a form which is perceived differently to that provided by the veterans. The balance is fine but necessary to gain the confidence of the attendees. The gains from their inclusion are manifold. 29. Telephone. Mobile telephones do not operate north of Hawker and are patchy in the Captain’s Mountain area. However, telephone communications are available via a landline at the Shearer’s Quarters and at the SSAA Complex at Captain’s Mountain. A satellite telephone was available in the bush during both treks if an emergency arose. It was not used. 30. Radio. While in the bush, UHF CB hand held and vehicle mounted radios were used for communications on simplex. Duplex on Channel 3 is also available at Moolooloo for contact at greater distances by UHF. 31. There is no doubt that the isolation and the live-in nature of the trek are powerful catalysts in conveying opinions and promoting disarming honest comment from all concerned. Sustained by the opinion of strong anecdotal evidence, the trek was an outstanding success; this comment applies to both male and female versions. However, the realization that behavior affects relationships and behavior modification may offer an answer to an unsatisfactory personal life is just the start. In the opinions of the participants, they have universally achieved a number of goals and leave equipped to face the challenge. By their own admission, not only have the participants faced and discussed their problems frankly among the other attendees and staff, many have formed relationships which are based on personal and common problems. 32. For some this is the commencement of a long journey; understanding and further help will assist in their arriving at a better place. The real test will be to carry the determination into each individual’s domain and anchor that in their lives. It is desirable that participants form a mental strong point to which they can retreat before consolidation and continuation. It is this aspect of the total picture which requires much greater external support and follow-up from existing supporting networks. 34. Both the participants and staff believe that there is an ongoing role for programs of this nature for veterans. The principles may also be applied to other vocations. The trek may not suit every veteran but it is a valuable and effective adjunct to other treatment. 35. Further information about the Foundation and trek is available on the web site at www.trojanstrek.com. 2. The trek which targets veterans from conflicts post 1980, was the sixth run to date. Until 2013 male only treks have been conducted, but this year the Foundation decided to conduct a pilot female version of the trek which would be run separate to, but in parallel with the male version. This has not been previously attempted because of financial limitations. With assistance from Health SA, Adelaide Rotary Club, RSL Care and the RSL (SA) the venture was made possible. 3. The aim of Trojan’s Trek is to provide a setting and conditions under which participants experience a lasting positive shift in personal values and interpersonal relationships. 5. In order to justify the program’s claims to successful outcomes, four standard psychosocial instruments have been administered since trek one in 2009. 7. In some respects these instruments are repetitive, verging on annoying for those compiling, but efforts to identify more appropriate tools through the Psychology Faculty of UniSA and VVCS have not met with success. There are obvious benefits in maintaining use of the current measurements which can be directly compared with earlier data, therefore at this time no changes are predicted in the short term. 8. 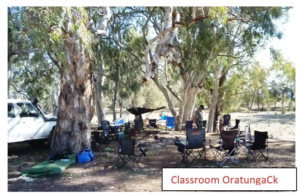 An honours student from Uni SA has recently commenced a longitudinal study into the longer term impact on the trekkers after a 12 month period. Although the results from such a study will be of interest to the Foundation and staff, many factors outside the influence or impact of the trek may affect long term outcomes. There are in place strict guidelines governing personal identification and the use of the data to protect confidentiality. Following a request from VicAmb, two of their members were short listed to attend if vacancies became available. 10. Female. The response from the women was above expectation, both in rapidity and numbers. Nominations were closed at 16 which was more than the ideal number of 12. The willingness of the women to become involved in an Australian first was reassuring. 11. Because the male and female teams would be separated, it was necessary to identify and train two suitable female facilitators to accompany and control the women. This arrangement would comply with the successful formula which had been used with the male team. The selection proved to be far from a simple task as the selected women would have to meet certain criteria which fitted with the concept and philosophy of the trek. The search took more than nine months to identify two suitable persons to accept the envisaged role. Given the non-scientific nature of the process, the outcome was most pleasing with two very committed and aware women taking on the role. 14. Because 11 women and eight men were from locations other than Adelaide it was necessary to identify budget accommodation to cater for them in Adelaide. The males were accommodated in the Granada Motel on Portrush Rd and the women in the RAH residential wing. Both locations proved to be satisfactory although the women’s accommodation was reported as “noisy but safe.” Both locations offered suitable pick-up areas free of City Bay hindrances on the Sunday morning. 15. Because of the state of the roads in the area of the trek, the use of 4WD vehicles is necessary. This mode of travel offers an additional benefit, in that during transit from one location to the next, it is the practice for one staff member to travel with three participants in each vehicle. This provides the opportunity for further discussion related to the presentation just concluded or in fact to any other issue which surfaces. And that happens so frequently the staff refer to the practice as moving in “mobile consulting rooms.” It also affords the chance to mix different individuals and staff with an aim to maximize exposure to others’ views. This has proved to be beneficial. This year a cheaper vehicle hire deal was arranged with Complete 4WD Hire and two vehicles were again kindly loaned by Pioneer Tanks of Norwood. 16. The program which was adopted for the female team included a number of presentations which are used for the male team. Subjects such as Communication, How the Brain Works and others were part of the list. Because of the generic nature of the subject matter and the honed skills of the male presenters, it was decided to use male staff for these presentations. 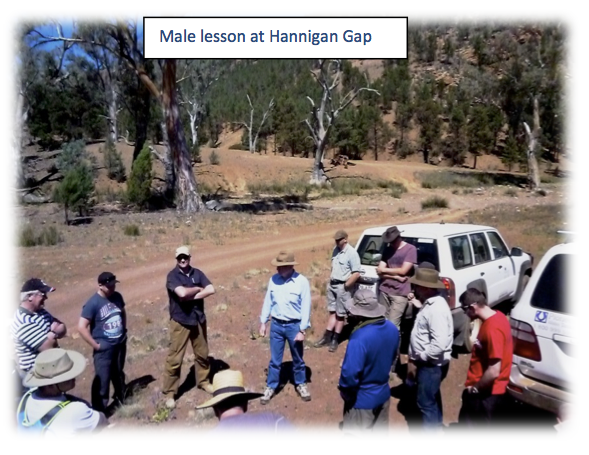 However, because of the more static nature of the female team (located at the Blinman Hut) the sessions often involved the male presenter travelling up to 8 km to deliver. Although this may not sound significant it took the male facilitators away from the male team for periods up to 2 hours or more. The absences were manageable and did not appear to detract from the overall outcomes. However, it is a subject to be considered for future planning. 17. As previously indicated, participants are self-nominating. However, it is important to gain approval from their treating doctor to avoid including individuals with the potential for self-harm or pose a danger to the staff. This was achieved as part of the nomination process by the submission of a form signed by the participant’s doctor. Note. For all except the arrival and departure nights, the participants and field staff including the Director spent four days and three nights in the bush. The staff numbers were satisfactory and the response to mentors was positive particularly from the women. 19. Ginny Stein and cameraman Brant Cummings from ABC TV Lateline visited and remained with the group for approximately three days during which time material for an ABC TV program Lateline was captured. The program was aired on 10 October. Initial concerns regarding the visitors’ presence and a TV camera were quickly forgotten. Filming and questioning was handled sensitively by the ABC members who were well versed in the individuals’ issues and privacy matters. You can watch the report here. Eleven 4 WD vehicles; two towing a covered and an enclosed trailer, and one towing an uncovered trailer. These were also used to transport the staff to Moolooloo HS. The vehicle with the enclosed trailer was dispatched 24 hours before the main body to allow for early preparations. Discussion regarding the early deployment of some of the instructional staff was discussed following the trek. There are obvious advantages in having key presenters on the ground 24 hours prior to the trek commencement. This is a matter for further discussion. 21. The insurance excess which applies to hire vehicles in the case of accident remains a matter of concern. In spite of a payment of $33 per day per vehicle to reduce the insurance excess to the minimum in the case of accident, the excess remains at $2,500 (single vehicle accident) and $550 (multiple vehicles). No claims were necessary. There appears to be no way to avoid this exposure. 22. For this trek it was necessary to purchase additional swags to cater for the female team. Fifteen swags were purchased at a total cost of $2380. This is expensive but unavoidable as swags cannot be hired. It also presents an additional storage issue. 23. A combined briefing for the participants and partners was held on 19 September at the RAR club in Linden Park. Partners were invited as past experience has shown that it is an advantage if the partners have some understanding of the veteran’s condition and the objectives of the trip. Interstate partners were not able to attend. Nonetheless, for those who did attend they reported it was a valuable session. 24. 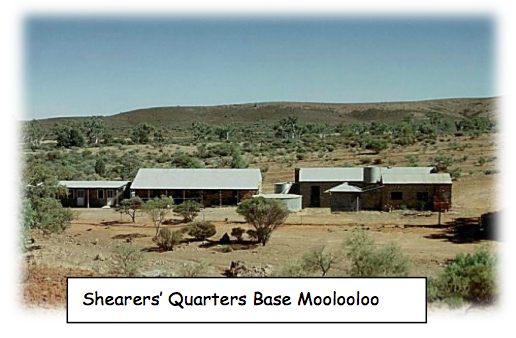 The trek established a base at Moolooloo HS Shearers’ Quarters which is 32 km NE of Parachilna on the Glass Gorge Road. The station occupies approximately 540 square miles of country which varies in type and relief from east to west. The distance to the area of the trek is approximately 520 km. Travelling these distances is time consuming and expensive in fuel, but the advantages in having no mobile telephone, television or radio reception more than offset the disadvantages of travel. A trip of this duration also permits the participants to get to know each other en-route. The feedback from the participants on the location is positive. 25. A press release prior to the trek was issued through the RSL in combination with Lesley Johns Media. No calls were received in response. 26. The use of a period set aside daily to complete individual journals has proved to be an important element for participants. The journals are used to record personal responses to the various lessons of the day and to make general comment on the trek. This has proved to be satisfactory from the point of view of progressive comment and also provides an opportunity to collectively review and anchor the day’s lessons. Although these comments are qualitative they do represent the perceptions of the participants at the time and are not always strictly in accord with the quantitative measurements gained via the psychosocial instruments listed at paragraph 5. This is considered to be a limitation of the tools used to measure change. 27. The messages which are conveyed during the trek are related to relationships and behavior management. Simple subjects; but the style and method of delivery combined with the surroundings make the messages much more powerful. There is no doubt that the live-in nature of the trek when shared with other veterans is a significant factor in the success of the program. 28. On Tuesday evening 25 mm of rain fell on Moolooloo. This caused some creeks to run up to 400mm deep and delayed some aspects of the program, namely the combined male/female breakfast and session on Communications. In some individual cases it was a harsh reminder of the folly of sleeping too close to a water course. The time loss was absorbed by some program amendments which did not affect final outcomes. The frequency of rain in such quantity that time of year is most unusual but of interest and welcome. 29. On the last evening, a staff debrief was held in order to capture the immediate thoughts of the staff. A number of matters were raised which will be considered during planning for the next trek. 30. On the last night of the trek a ’tick and flick’ survey was issued and completed by the participants. The questions were aimed at an immediate response to the trek and were primarily designed to gauge how the course was conducted, the efficiency of the administration as well as an opportunity to comment on the content. 31. Telephone. Mobile telephones do not operate north of Hawker which is approximately 88 km south of Moolooloo HS. Telephone communications were available via the homestead telephone to the outside world. 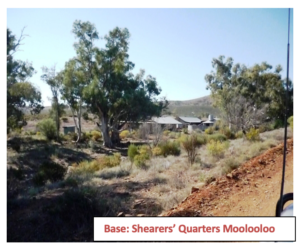 This was in contrast to a previous arrangement which saw a telephone connected to the shearers’ quarters, (the base location) through close liaison with a CFS contact. This is preferred. This option will probably add to the costs in the future. A satellite telephone was available in the bush if an emergency arose. It was not used. 33. A doctor was not available for this trip. The nearest fully equipped hospital is at Hawker, approximately 1.2 hours away. First line medical support was provided by an ex-defence force member who is now with the Victorian Ambulance service as a Para-medic. He arrived fully equipped with his own vehicle and equipment. He undertook training in CPR for the teams. A number of other staff are also qualified as senior first aiders. 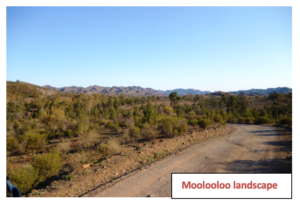 The longest exposure to the most serious risk was assessed as traffic accidents during the trip to and from Moolooloo. No medical or psychiatric issues arose. 34. The delivery of the male program and some aspects of the female program was the joint responsibility of the Chief Instructor Robert Kearney and civilian consultants Peter Keith and Andrew Badenoch. Additionally a number of female centric topics were presented to the female team by the two female facilitators, Connie Jongeneel and Anna Sutcliffe. Their collective credibility and insight made for interesting and varied sessions which carry a common message presented in a unique way in a different environment. This trek was again utilized to provide training for other past trekkers who are part of the succession plan. Two mentors were placed with the female team and one with the male team. All performed well. 35. In the opinion of the participants, the lessons and program outcomes appear to be more effective when delivered by a veteran as opposed to clinician in consulting rooms. This is completely in accord with the philosophy on which the trek is based; that is older veterans helping younger veterans. In other words, the tribal elders provide advice and encouragement to the young. This approach has been adopted over many thousands of years by other civilizations and in today’s society is adopted by alcoholics and gamblers. 36. The tenor of the week is relaxed yet highly focused on outcomes. This comes as a surprise to most of the participants whose expectations are for a course run along military lines. This is the antithesis of the practice. 37. 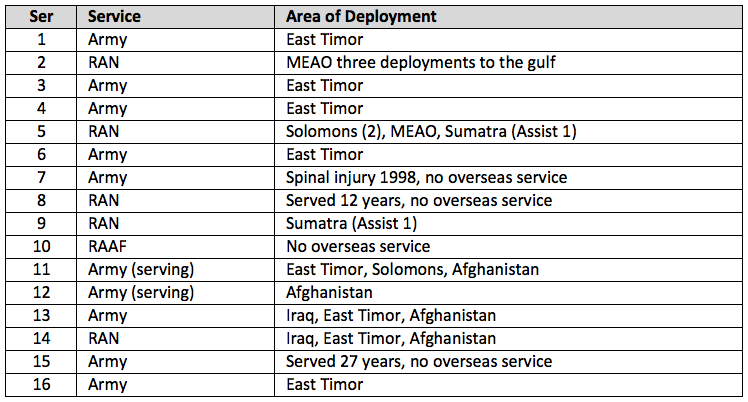 The inclusion of two civilian experts provides a balance to the military presence. They deliver sessions linked to their expertise and are skilled in providing advice and encouragement in a form which is perceived differently to that provided by the veterans. The balance is fine but necessary to gain the confidence of the attendees. Both these members have been instrumental in providing follow-up advice which in a number of cases has resulted in job placement. The gains from their inclusion are manifold. 38. This aspect of the experience is important if the impact of the trek is to be maximized. It also would be beneficial if an organization with greater resources could become actively involved in follow-up. This year the Director of VVCS advised he would be present at the conclusion in Adelaide. Unfortunately, he was unable to attend at the last minute. the development of an achievable business plan to support the Foundation’s objectives. 40. There is no doubt that the isolation and the live-in nature of the trek are powerful catalysts in conveying opinions and promoting disarming honest comment from all concerned. Sustained by the opinion of strong anecdotal evidence, the trek was an outstanding success; this comment applies to both male and female versions. However, the realization that behavior affects relationships and behavior modification may offer an answer to an unsatisfactory personal life is just the start. In the opinions of the participants, they have universally achieved a number of goals and leave equipped to face the challenge. By their own admission, not only have the participants faced and discussed their problems frankly among the other attendees and staff, many have formed relationships which are based on personal and common problems. 41. For some this is the commencement of a long journey; understanding and further help will assist in their arriving at a better place. The real test will be to carry the determination into each individuals’ domain and anchor that in their lives. It is desirable that participants form a mental strong point to which they can retreat before consolidation and continuation. It is this aspect of the total picture which requires much greater external support and follow-up from existing supporting networks. 42. One of the discoveries which more than half of the group became aware of was that they and their families have lived through personal problems thinking they were alone in their pain and frustration. All of the participants exchanged email addresses and intend to maintain contact and provide advice and assistance to each other. This internal bonding is proving most valuable in their respective journeys. 43. Both the participants and staff believe that there is an ongoing role for programs of this nature for veterans. The principles may also be applied to other vocations. The trek may not suit every veteran but it is a valuable and effective adjunct to other treatment. 44. Further information about the Foundation and trek is available on the web site at www.trojanstrek.com.